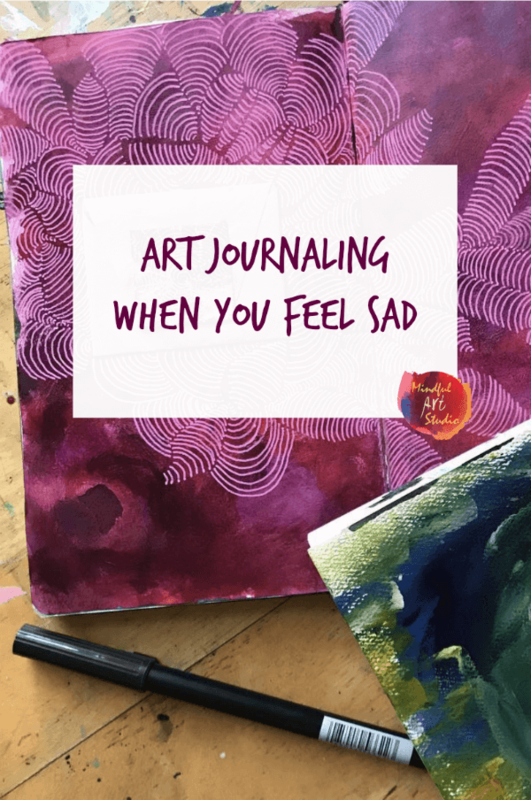 One of the questions I get asked most is how to art journal when you feel sad. 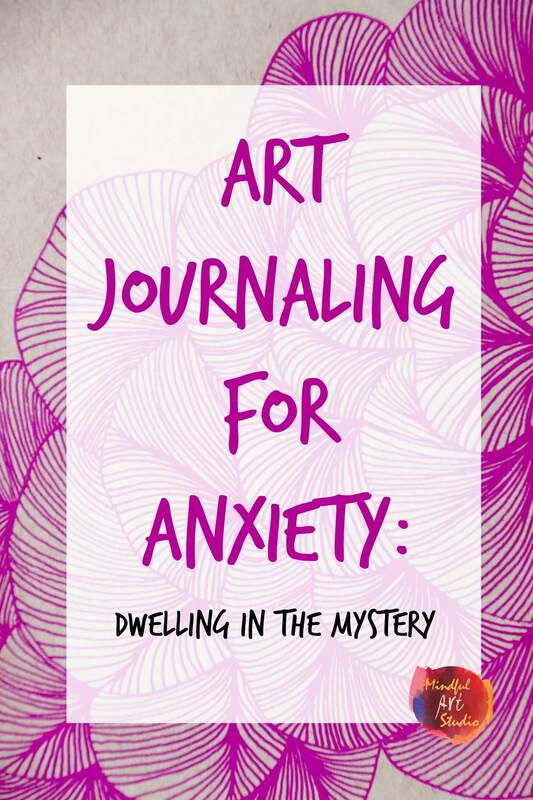 My art journal has been a great source of comfort and self-understanding for years. I’m blessed to be able to share my techniques here. 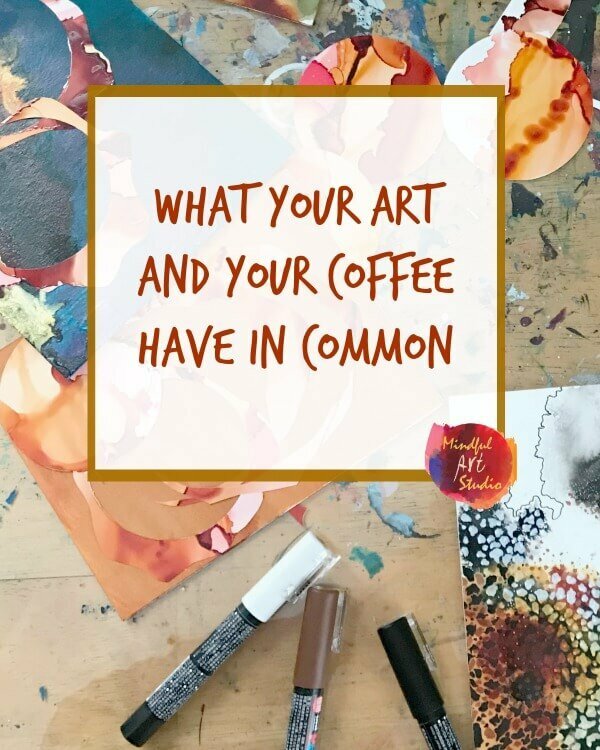 I’m hoping this post will help get you started when you want to art it out in your journal, but you’re not sure how. Even if you’ve never made art, or never thought about making expressive art, I want to assure you humans are uniquely creative beings. 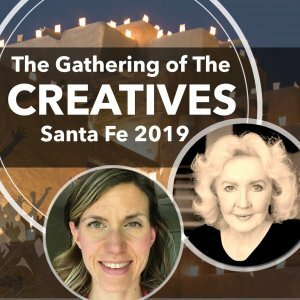 We have been using the arts to process our feelings, and mark important moments in our lives since the beginning of time. 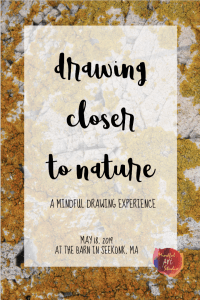 Art as a coping tool belongs to me, to you, and to us all. 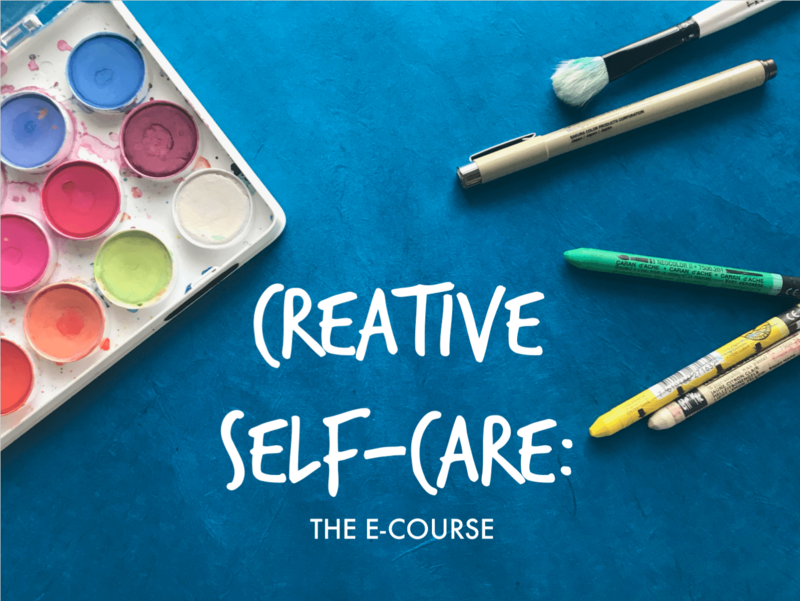 As an art therapist, I’m lucky to have a lot of training in how to use art for self-expression and healing. 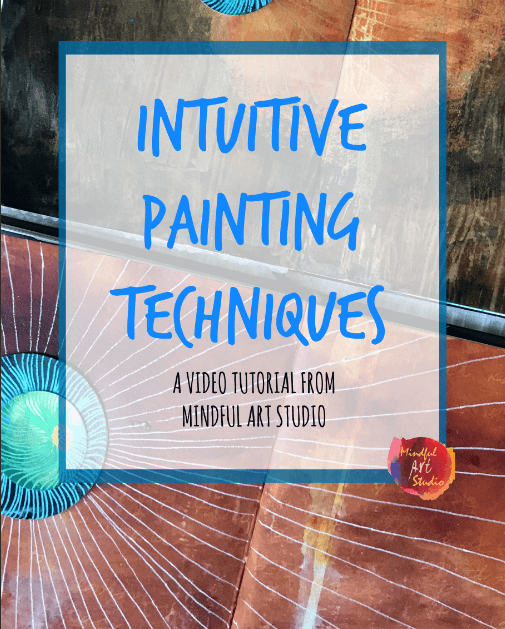 While I no longer practice art therapy, I still use art to help myself feel better, and I love teaching these age-old techniques to others as well. One of the blessings of my art therapy training was learning to focus on art process over product. 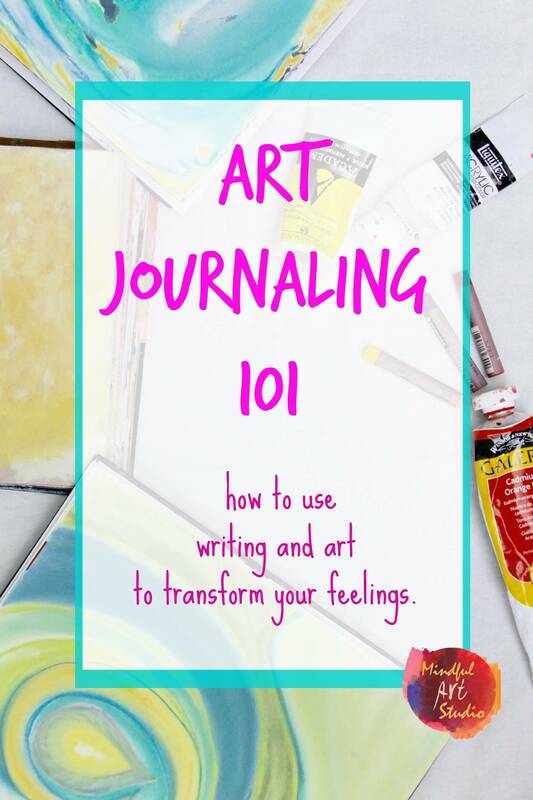 Of course I know you are art journaling because you’d like to make art, but getting overly focused on it can tighten you up and ensure that you won’t express your feelings or make anything you like. That’s a lose-lose. 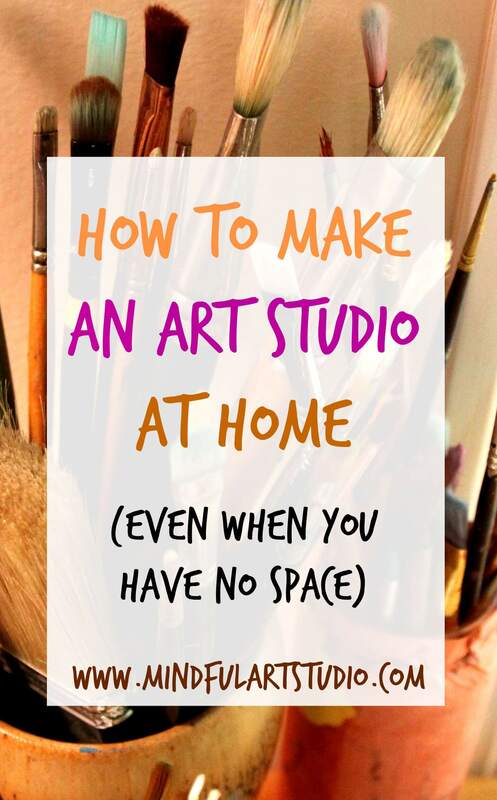 As many artists know, the more you create, the more you open up space for exploration through your art materials, the more the process of art making becomes a balm to your soul. Funny enough, the more you do this the more your product improves too. It’s weird the way that works, isn’t it? That’s a win-win. The other thing I’ve found that really helps me to loosen up, create, and express myself is working in layers. I find layers give me lots of permission to make mistakes, try out new things, and not have to know what the finished product will be. This helps me express myself. 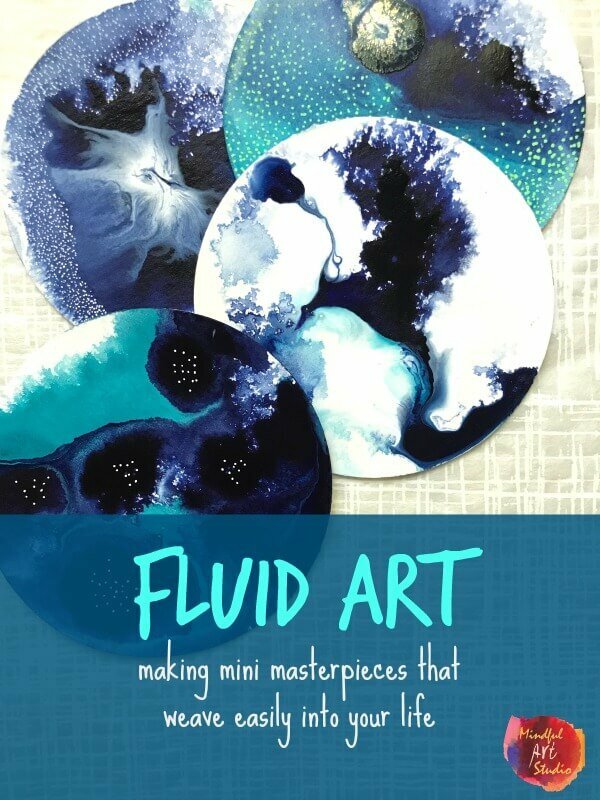 When I art journal because I’m feeling down, I don’t want to have to think too much, so I’d like to share a sort of art making formula that has helped me. You can use some of it or all of it, depending on what feels good to you. Write a letter you’ll never send. This helps me clarify my feelings and get them out. Describe how feeling sad makes you feel in your body. Create a poem about feeling sad. Honor your sadness: “Talk” to sadness as though it were a person. Honor it. Give it some room to speak back to you, perhaps even in a dialogue you write in your journal. Sarcasm: Have a mock conversation with someone and be as sarcastic as you wish! Imagery: Describe, with words, the images that come to you when you feel this way. Flip the table: Write about how you wish you were feeling right now. Conceal your feelings: Write over and over your own writing until you can’t read it. 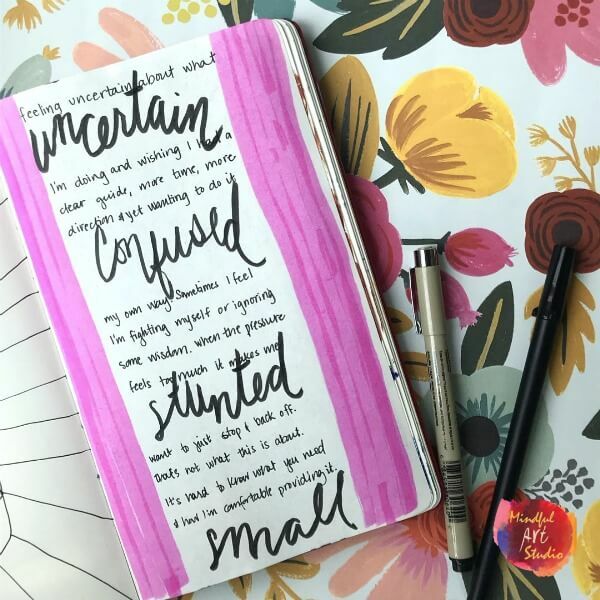 This helps create texture on your page, in your own unique handwriting style. I find this very cathartic too. Reveal your feelings: Write in white gel pen on a white page, and then paint over it with high flow acrylic paint. Some colors also cover the writing more than others. 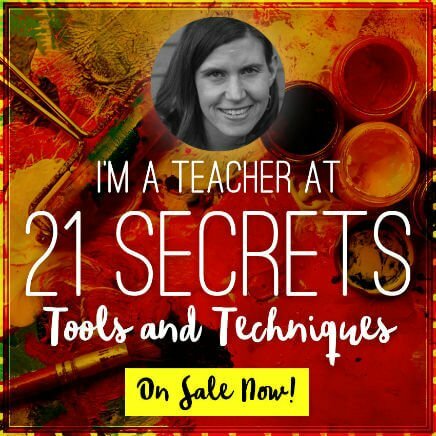 This is a fun “magic writing” technique you can use either to reveal or hide your writing. 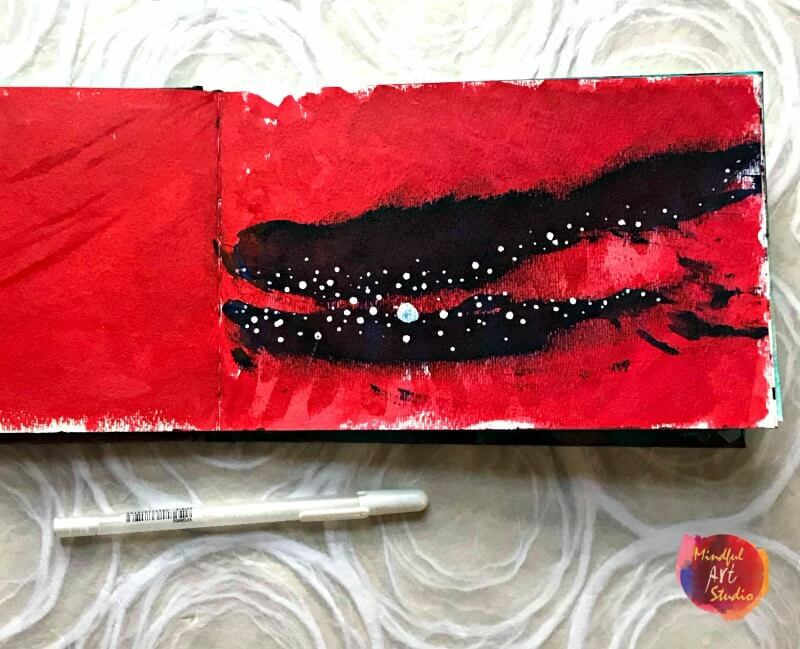 Black page, white stars: Paint your page black, then use gel pens to create a galaxy of white stars. 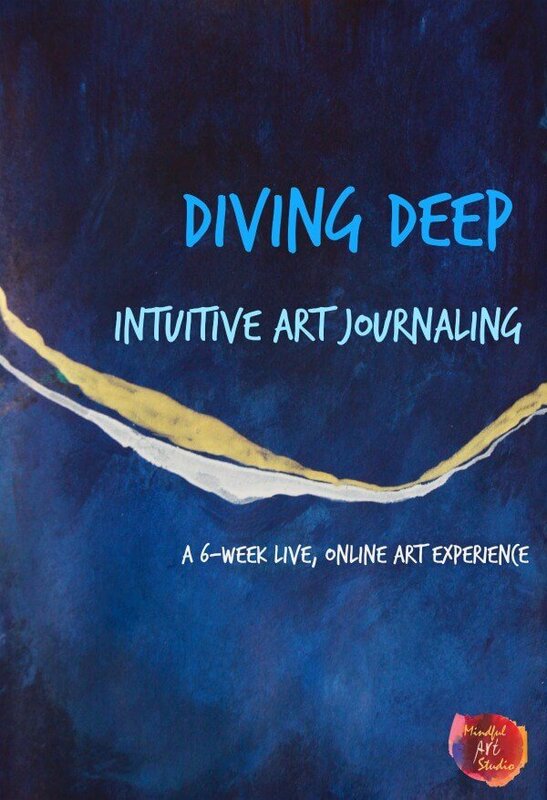 Take my class, Art Journaling 101 for more guided lessons on using art and writing in transformative ways. Write out a poem that expresses what you’d like to feel. I love Rilke and Mary Oliver. What about you? Write hope, love, or joy in block letters. Then write inside about what gives you hope, love, or joy. Gratitude journaling: Write in block letters something you are grateful for, then write about why in a circle going around your letters. Fold your own envelope, paste it to the page, and put a letter inside to someone you love. Creative writing: Write a story or poem about what you wish was happening right now. 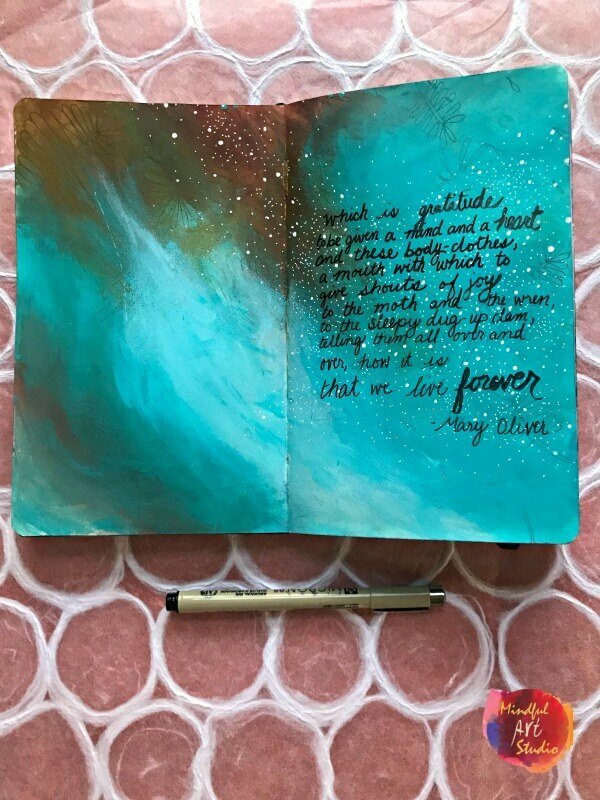 Use a script liner brush and paint to write down a message of encouragement. 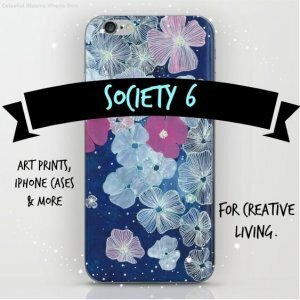 Draw an animal that symbolizes protection, freedom, or strength for you. You can draw it cartoony or realistic. I like to find a photo and work from that since I’m not good at brining the image clearly enough in my mind. Draw a repetitive pattern with a paint marker, gel pen, or brush. 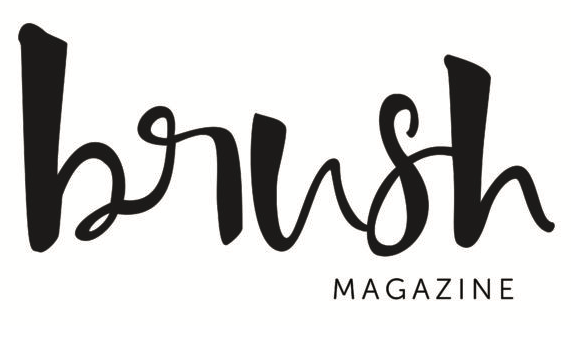 Use dots, circles, dashes, or wiggly lines. Imitate something in nature or make up your own based on what feels good to your hand. On light backgrounds, you can use a Micron pen too. Use a photo to draw someone you love. 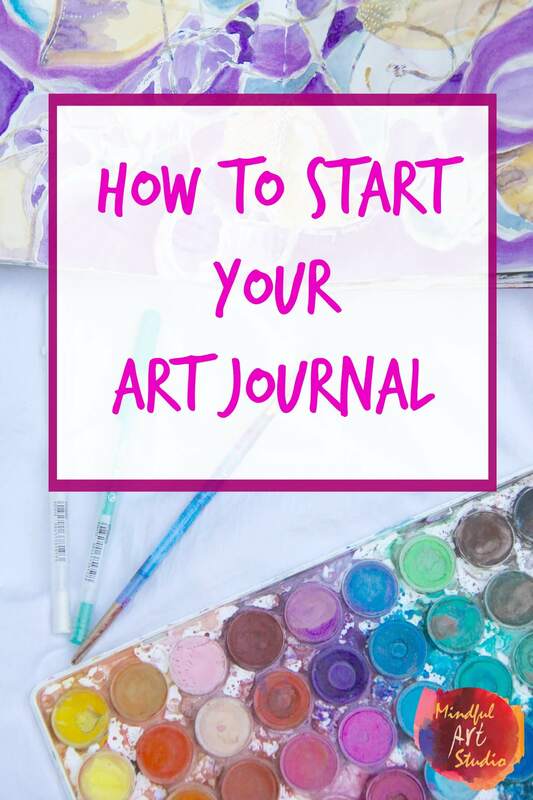 You can also paste it into your journal if you prefer not to draw. Illustrate a place that makes you feel happy. 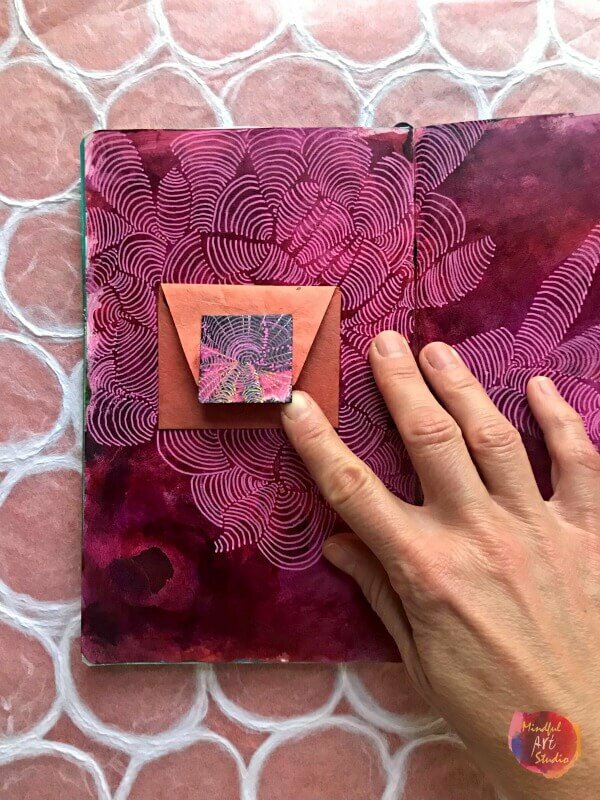 Be sure you are on my mailing list for more art journaling ideas and inspiration! 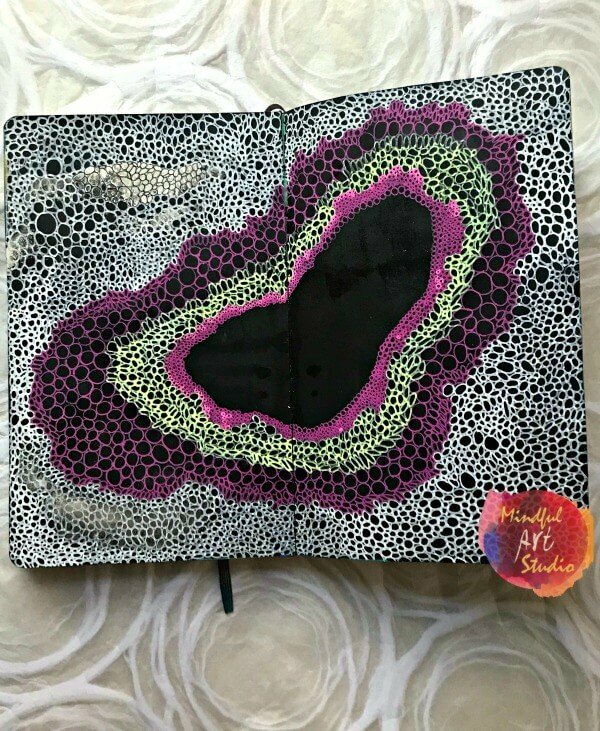 Remember, I’m sharing ways I use my art journal in my own life to feel better. 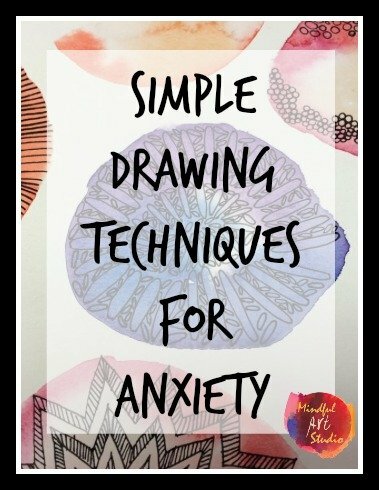 This isn’t art therapy, and in no way should be seen as mental health treatment or advice. If you are facing overwhelming feelings or mental health struggles, I hope you honor your pain by getting the support you deserve. 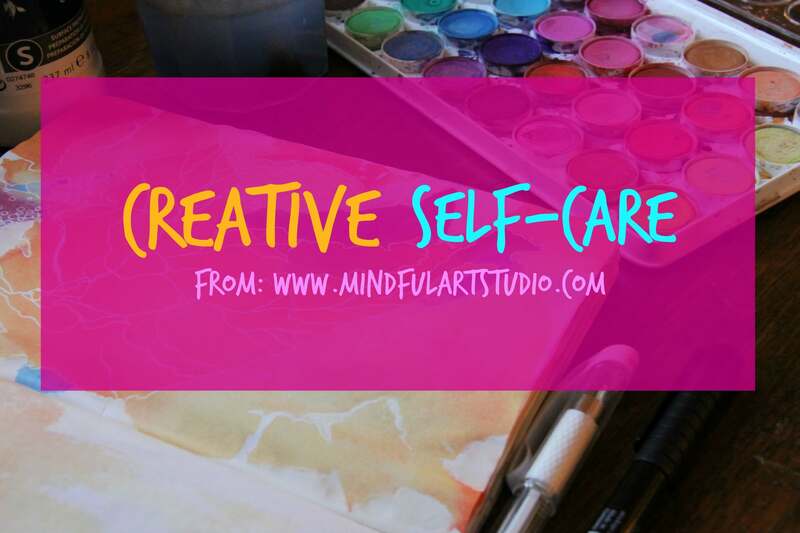 If art therapy feels like the right option for you, you can find a local art therapist here. The links shared in this post are affiliate links. 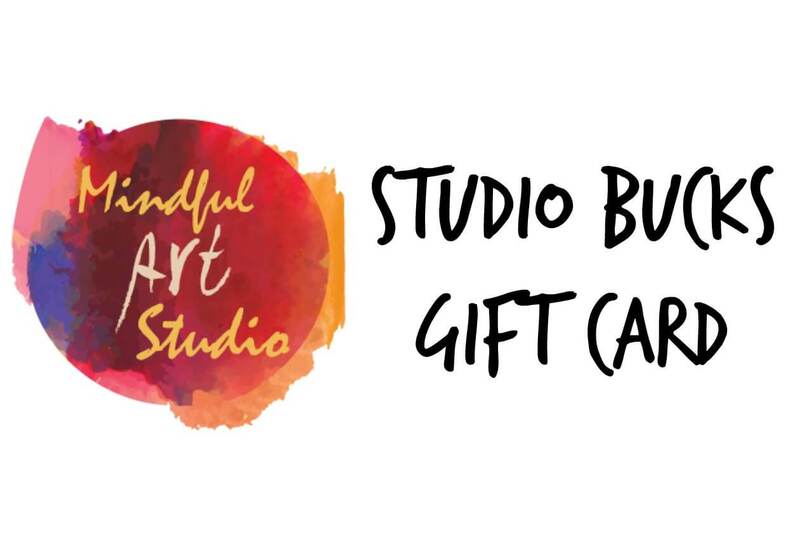 That means if you choose to purchase something after clicking the link, at no extra cost to you, you will support the work of Mindful Art Studio to empower the artist in everyone. Thank you! Thank you for these tips. I lost my sister this past summer, and then my mom last month. I have been searching for a way to process the sadness while being overwhelmed with the business side of death. This gives me a way to acknowledge my feelings. Great ideas. Oh gosh, Karen. it’s a lot to process. What a weight on your heart. My mom died in 2011 and then my brother a few years later. I can only imagine what it’s like for you. 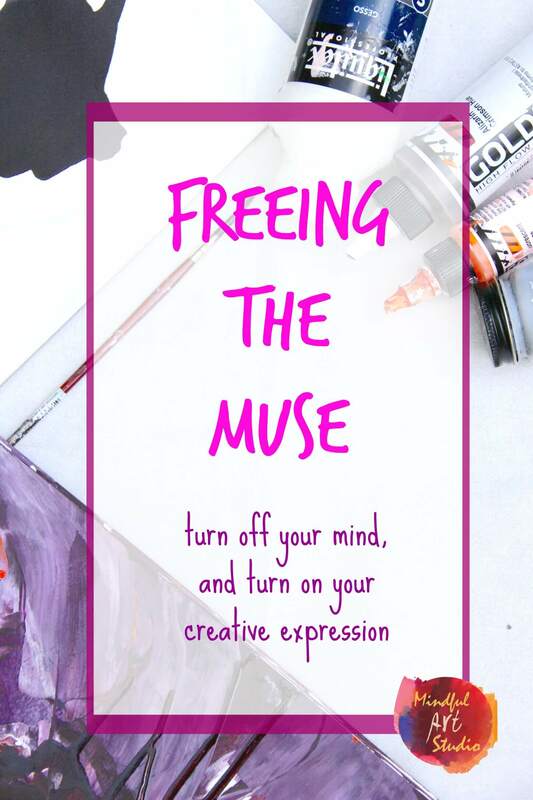 I am so heartened to know that you see some ways to use these ideas and I sincerely hope your own art wisdom mixes up with these ideas and that you find your own special path through grief. Everyone is different. For me, I can tell you that I’ve found a lot of comfort in talking to my mom and brother through my journals, both in words and pictures. I love these ideas Amy! I’ve never used writing in my art or art journaling, but I tried just a little bit of writing within a drawing. I expected to throw it away afterwards, but instead I loved the effect it had in my drawing and also it gave me a great feeling! Now I know I can use writing in my art to Express fear, anger, depression and sadness without anyone being able to read it clearly, and the end result can look awesome too! Christina that’s so exciting! 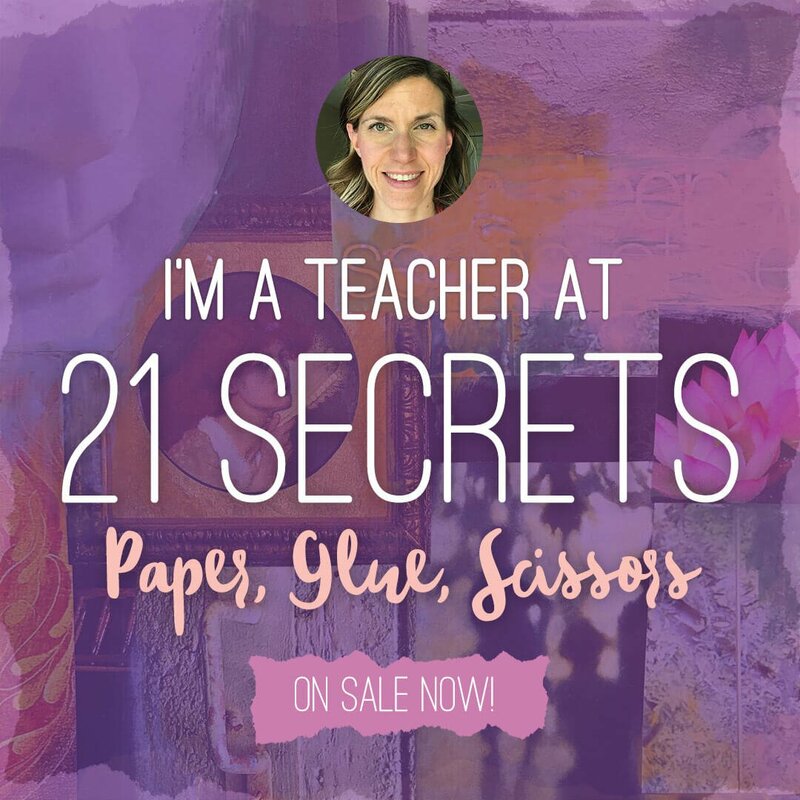 I’m thrilled to hear you’ve already given it a try and that these ideas spark your interest. I love these ideas. Sometimes I feel blocked and don’t feel like doing ‘good’ art. 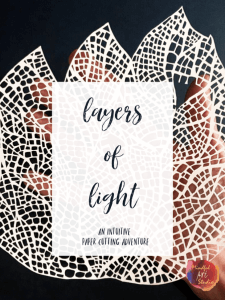 I love having one journal that has a bunch of unfinished layers that I can use for experiments and processing. Oh I’m so glad that this speaks to you! I feel the same way, and it’s funny how often those experiments are junk and often they lead to something great on another piece, and sometimes they turn to gold! Dear Amy, this summer, I have discovered your website. 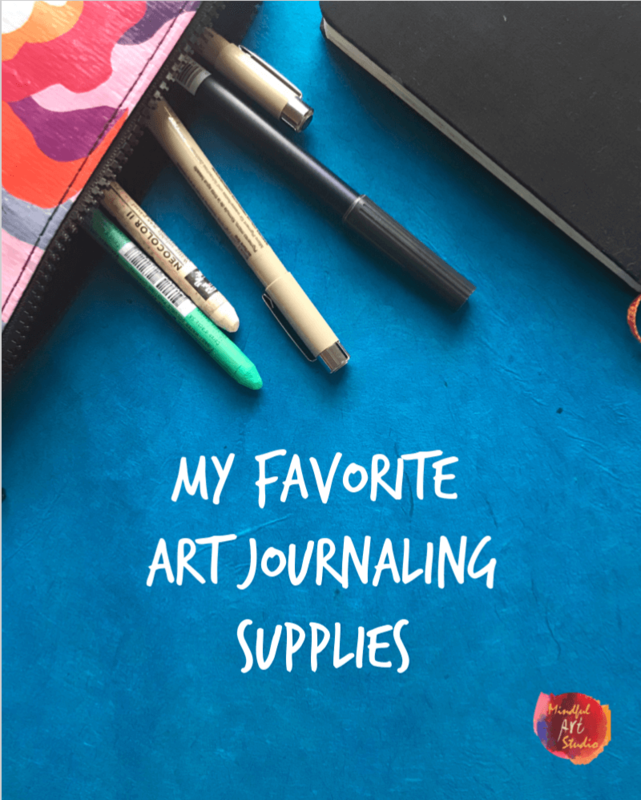 I‘m so grateful for the inspiration and permission you have given me to start with my first art journal. 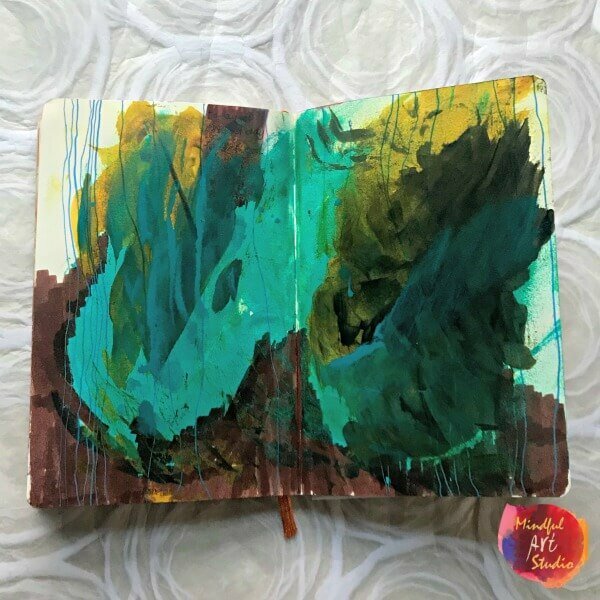 I‘m chronically ill, and art journaling allows me to express my feelings in a very honest and intuitive way. By adding layers of color and text, I can transform them. The effect is so fabulous. Feelings of sadness or anger which I would normally hide allow me to create beautiful pages. Thank you again! 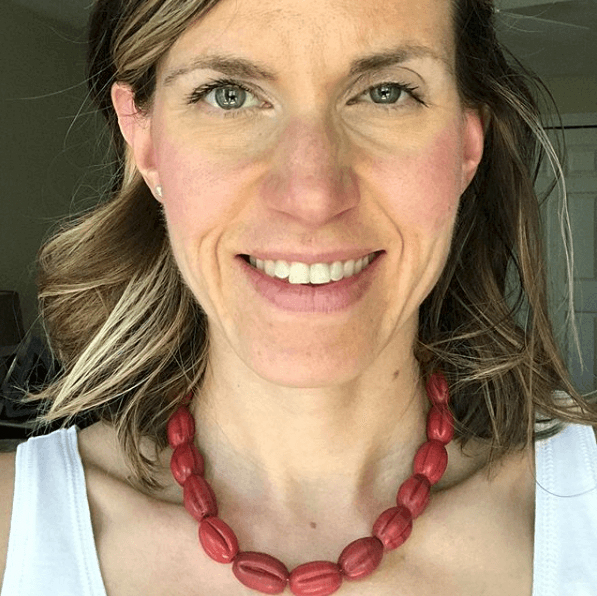 Thank you so much for reading and taking the time to inspire us with your story. 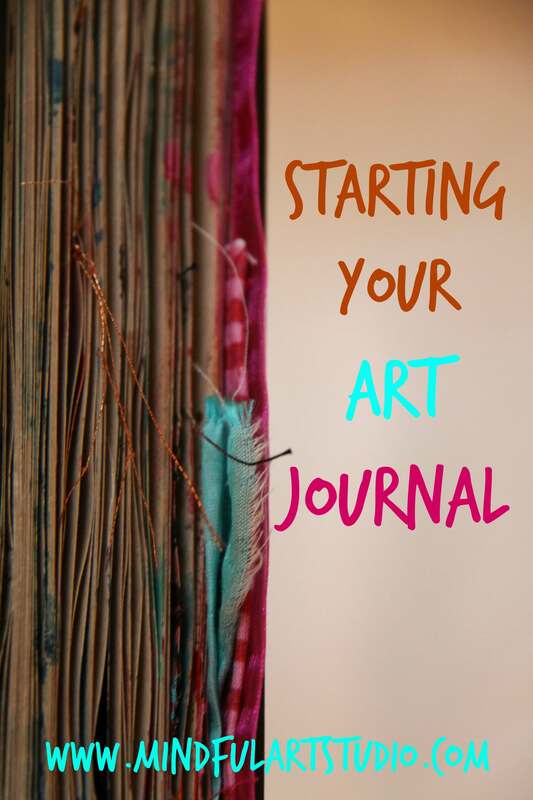 I know that your words will help others to get started in their own journals. 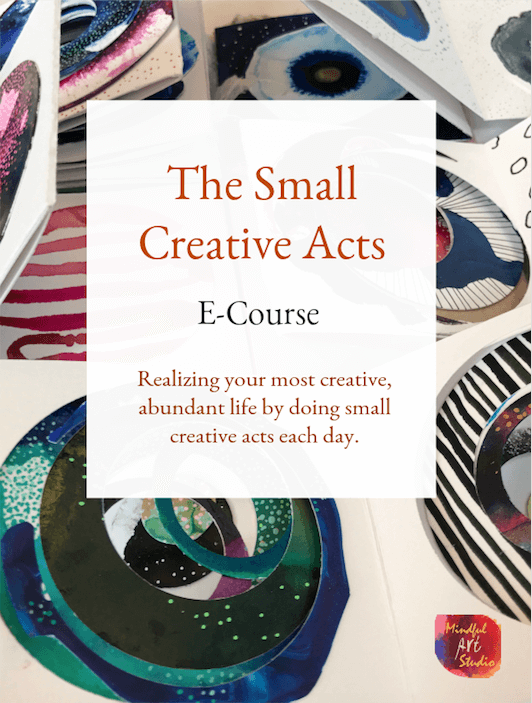 I’m thrilled that I can be a small part of your comfort and creative discovery.